For the last couple of days I’ve been working on a tiny extra painting of Walton for my On the Edge project. And this afternoon, after a bit of splashing around with white acrylic ink, I finished it. 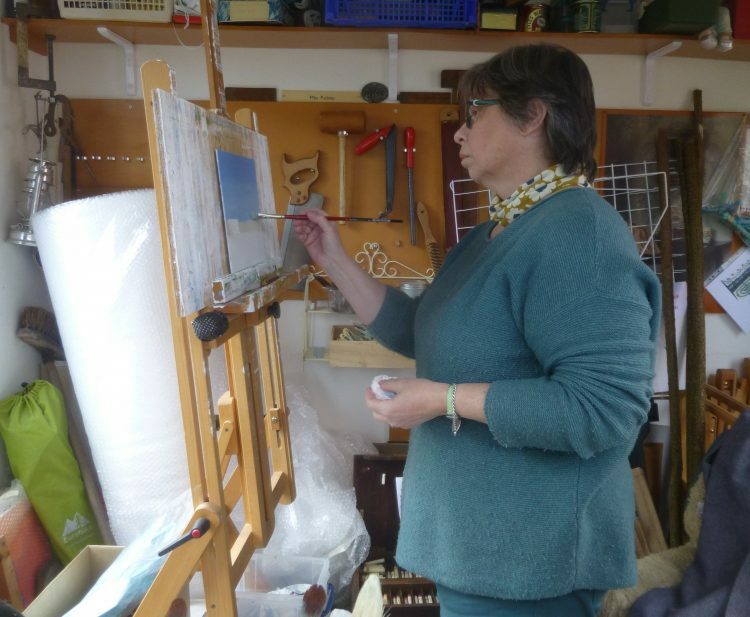 It is much smaller than my usual paintings, being only about 25 cm wide and 20 cm high. 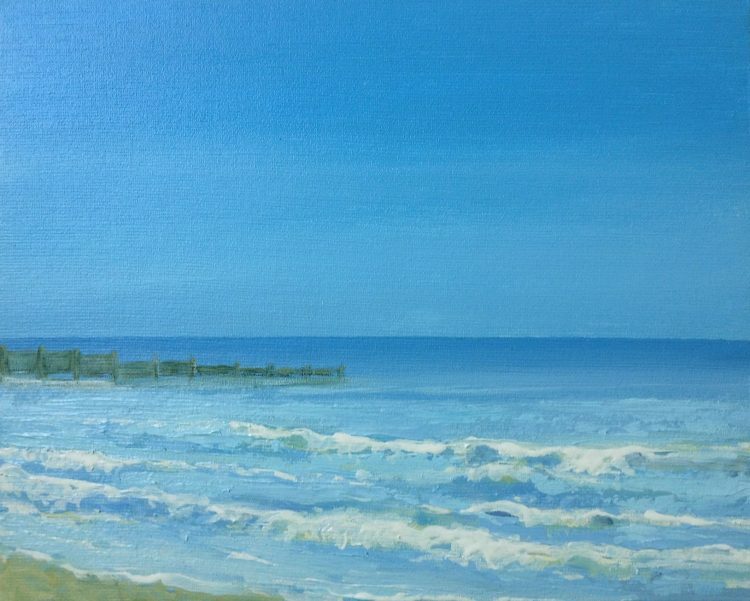 I have one more Walton painting that I’m thinking of doing, while I’m waiting for some decent weather to go further afield, and this next one does not feature the sea at all . . . ! 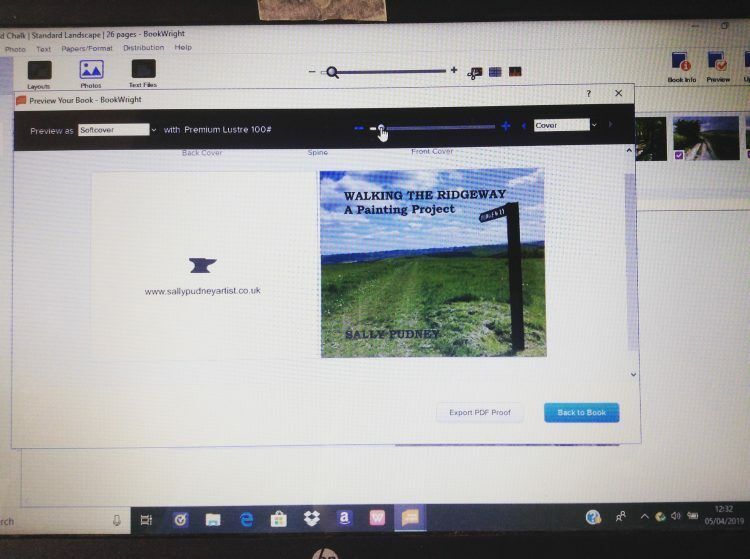 New Book: Other news – I’ve just ordered the first batch of copies of my Ridgeway book. Here is the back and front covers on Bookwright, which is the software for blurb.com, the self publishing company which I use for all my books. I’m hoping they will be here by the end of this week. As soon as they do arrive they will be going into my website shop priced £20.00 including packing and postage to any UK address. They feature images of all twelve of my Ridgeway paintings, plus notes about what I saw and heard as I walked. Cards: Do you have April or May birthdays coming up in the family? Or are you just looking for an alternative Easter card? I’ve put together a little pack of my April and May bluebell wood cards – two cards of each design, with envelopes, blank inside for your own message, for £10.00 including packing and postage to any UK address. They will be going into the shop tomorrow, so check back if you’re interested.